Warehouse deliveries are one of our specialities – delivering cool food, Polar Bears & more. Pallet deliveries done and dusted daily, drivers delivering delcious delicacies directly. Yep, we even do carton deliveries – keep it cooler than a mother-in-law stare! 80% of our cool customers are now booking transport via the web and able to obtain their job reference number immediately; view the status of bookings; view and or print booking history, invoices and statements instantly. To obtain a username and password , complete the Request for Client Login form (it takes just a minute) and we will contact you within 48 hours with your details. The centre has been developed ensuring its easy use and logical format – let us know of any feedback you might have. Founded in 1986 with one truck, Adrian and Michelle Gaby in partnership have increased this to a modern, efficient fleet of Safe Food Accredited vehicles that can support a wide range of cold chain requirements. You know what we do, so let’s meet the team! “ Hans Continental Small Goods has for many years engaged the services of Gaby Cool Transport for deliveries of chilled and frozen freight between Brisbane and the Gold Coast. 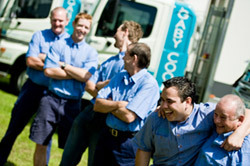 The service offered has been both route and bulk deliveries on a daily basis as required. Hans have found Gaby Cool Transport to be an efficient and professional organization as well as extremely cost effective in this extremely competitive industry. Refrigerated transport and frozen transport involves time dependent deliveries and our rapid responses and pro-active policies ensure your frozen deliveries and chilled deliveries arrive on time and at the right temperature. 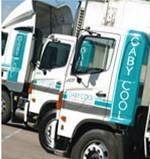 Gaby Cool Transport’s cool transport fleet comprises a wide range of Safe Food Accredited vehicles and is committed to providing a Cool Transport service. Transportation of refrigerated goods being the core of our business, compliance with Safe Foods Queensland Standards is critical. We ensure that all of our Operations are conducted within the legislative guidelines for our Industry and are compliance assured. You cool with that? Check out here for more on refrigerated transport.